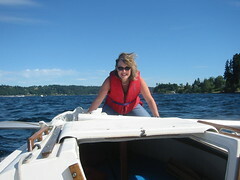 My sister Ellen is here from Sacramento and I wanted to impress her with a Puget Sound sail to Blake Island. The wind was brisk, so I reefed the mainsail a little. About a half a mile into the sail, the mast blew over and broke off, falling into the water! A new experience for all on the boat, including the skipper! We were fortunate to recover everything and balance the mast across the bow as we carefully motored back to Southworth. After accessing the damage, I discovered that the cause of the mishap was a deteriorating cable connection (starboard stay). The girls were calm and helpful inspite of the excitement. I doubt that I will convince either one to get back on a sailboat. oh no! i hope you'll be able to fix it soon. that's too bad. i can't believe you had wind - i was sailing with jacqi's family out of olympia and we didn't have any wind all weekend. i guess it picked up a bit around the time we were near the dock. Yeah, Sunday evening at 6pm, it was blowing 15-20 in the middle sound.